Wood canape set (5 Pieces), "Tropical Mango"
Carved from cypress wood and painted by hand, two ripe mangoes become a tempting canapé set. Victor Hugo Lopez crafts one as a bowl, and the other to hold hors d'oeuvres on toothpicks. Two spreading knives and an open wood tray complete the set. 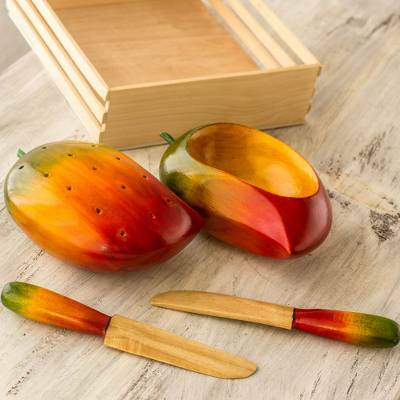 You can find wood canape set 'Tropical Mango' (5 pieces) by Victor Hugo Lopez in tableware categories such as Fruits and Veggies Serveware, Tropical Decor Serveware, Wood Serveware, Condiment Servers Serveware and Salt and Pepper Sets Serveware. Enjoy exploring these sections for other Novica treasures. Victor Hugo Lopez has received 6 microcredit loans with 0% interest from Kiva and Novica, the first for $100 and the most recent for $600. Proceeds were used to invest in the purchase of cedar and cypress woods for production. Woodworking had been an important aspect of Victor's community for many generations. Victor continues to teach his son and grandson his techniques so they can continue to preserve the craft for generations. Victor feels blessed to be able to reach so many people without having to leave his country. Most of his income is through NOVICA and he relies on it to provide for his family. With the help and support of his family, Victor has been able to grow his business and provide a better life for himself and his family. Victor was recognized for his work and received a scholarship to study microenterprise management in Oregon. This artist is an elder master and continues to actively practice their craft. Victor's work was featured in a catalogue of Guatemalan handicrafts. "Developing a new design is like planning for the birth of a baby. I draw, cut the wood, carve it, sand it and take it apart until I have a finished piece that makes me happy." "I work in wood. Like many people who work in this craft, I had a difficult childhood that helped me become a man who strives to get ahead. I'm a hard worker, and I've worked on my own for around 40 years. "My parents weren't artisans but, as a child, I did see a lot of people who were and I was fascinated by how much shoppers liked handcrafted wood art. I decided to learn, and the first thing I crafted was fruit carved from wood, which I eventually sold. "My family and friends consider me a creative person, responsible and innovative. I dream of being able to make my workshop grow and being able to sell my handcrafted designs all over the world. "I'm a simple man, good humored, and I enjoy talking with people about what I do. I like to explain the mechanics of my work, and also to create new things. This is not only to sell — creating entertains me and I get excited with each new project. I love beginning something new. Developing a new design is like planning for the birth of a baby. I draw, cut the wood, carve it, sand it, take it apart and start from zero until I have a finished piece that makes me happy. "At one time, I had a workshop with 40 carpenters working with me. But, as time passed, we had some bad seasons and a lot of competition. My work declined little by little. "I was one of the first artisans to craft fruit in the area, and I had a lot of apprentices, many of whom have become quite successful at this. Today, I am teaching my nephew and my brother in law to work with wood, paints and varnishes that can be easily obtained. We like to play with colors and discover our own combinations. Afterward, we sand the pieces and give them a lovely finish with varnish, as it is the perfection of the finishes that inspire me most. "At first, it was difficult, especially building a base of clients. But with hard work and effort, I've been able to continue working with this art form. I'm in charge of designing, crafting and sales, and everyone in my workshop has his own responsibilities so that our designs are of good quality. "We don't use complicated or modern tools, just a lathe, a band saw, a drill and a polisher. I enjoy showing the variety of fruit we have here, and its colors. "Right after the terrible earthquake of 1976, there was just no money in Guatemala and I had to go to Honduras to sell my designs. Thank God, we were able to keep the workshop and get through those tough times. "Apart from my work, I like going to church, and I enjoy reading about carpentry and decoration. In this way, I've been able to make my creations different and everyone seems to like them. "Once, my work was selected for a catalogue of Guatemalan handicrafts. I felt very proud because being selected for an international catalogue is a reason to celebrate. "I really enjoy my work and, over the years, it has let me take my designs far beyond the borders of Guatemala. I am so proud of the resources we have here. "I'm grateful to Novica for the opportunity to have a window to the world through the web page. I'm also grateful to you, the shoppers, for making your homes a cultural showcase for artisans like me, who live and dream of our work." I love these little candle ornaments! I purchased the carved wooden salad serving spoon and fork set as a birthday gift for my dad. He loves gardening and salad! I picked the radish ones as a gift because as a child, whenever my dad would plant his garden, I was usually given a corner as ""my garden,"" and I could plant what I wanted. I almost always planted red radishes, white radishes, and onions. So, aside from being a unique and lovely handicraft for a gift, it brings back a funny memory between my dad and I about how I was a ""stinky"" little gardener! Thank you so much creating these.